Generally, when a person has over 30 s for the body oxygen test, they do not have any sinus infections for many years. Therefore, breathing normalization (just breathe in accordance with tiny medical norms for breathing) is the ultimate most natural home remedy for sinus problems. Breathing retraining, according to 6 most effective trials on asthmatics, also quickly solves problems with major symptoms of asthma (coughing, chest tightness, and wheezing) as we discussed on other pages. The same treatment works well for pregnant and those who want to avoid antibiotics. However, since modern people have only about 15-20 s for the morning CP test (instead of normal 40 s), they commonly suffer from problems with sinuses. In some difficult cases, people experience poor immune-system function due to HIV-AIDS, cancer, cystic fibrosis and some other complex conditions. This makes them prone to sinus problems more often or even at higher CPs (sometimes up to 30-35 s). As a result, breathing exercises do provide a relief for this group of people. For example, these students can unblock the nose and make nasal breathing possible. However, these people can still suffer from ongoing sinus infections manifested in yellow or green mucus (sputum) coming out of the nose in the morning and during other parts of the day. Here is a highly effective home treatment for problems with sinuses. The remedy involves garlic solution. The effects are phenomenal: most people can get rid of sinus infections in about 24 hours. During active stages of the sinus infection, it is useful and effective to use a very diluted garlic juice. In other words, you need to make garlic juice and apply its drops inside your nose. You need a very small piece of raw garlic. The garlic pod (or bulb, or head) usually contains several (10-15 or more) cloves (smaller pieces) around the stem of the garlic pod. Get 1/3 or 1/2 of a garlic clove (a small part that is a section of the garlic pod). 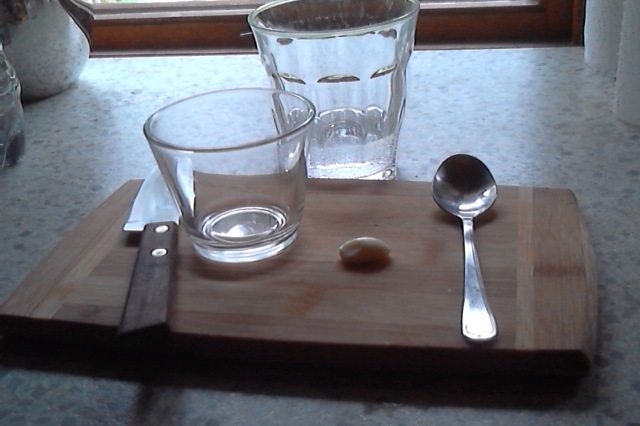 Here are all required materials and tools to make this natural home remedy to deal with sinus problems fast: a small glass container, water in a larger glass, knife, small spoon and a garlic clove (as you see below). 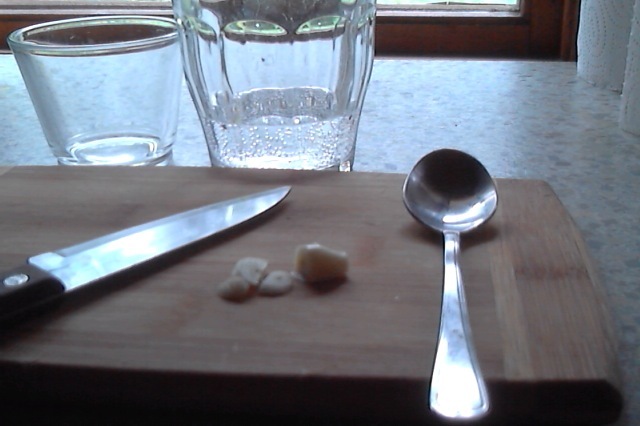 Cut this small piece (1/2 of garlic clove) on as tiny slices as possible. You will likely make about 10-20 then slices of garlic, as it is shown below. Put these slices in a small glass or ceramic cup. Add 3-4 tablespoons or water. Crush garlic slices with a spoon to extract some juice from garlic slices into this water (about 30-40 ml). When you press on each slice of garlic with a small metal spoon several times, you can notice that garlic slices become more transparent and water gets a light smell of garlic. 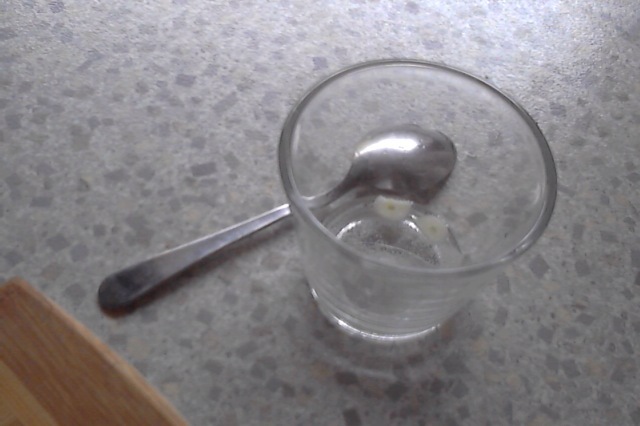 The next picture shows the results: crushed garlic slices float in diluted garlic juice. These slices (pulp or fibre) can be discarded. You can do it with a spoon (the same as when you remove foam from boiling foods that are cooked on the stove), or you can use a sieve (strainer) or paper napkin (as the image below shows). Now you have diluter garlic juice. Now you may try this home remedy, but only one drop in the nose and sinuses to check its strength. The strength of garlic depends on many factors, such as its soil (during growth), age, and storage conditions. After you applied only one drop for your sinuses, you can feel the effect of this treatment. If you get a strong burning sensation, often with watery eyes and sneezing, it is clear that the solution is too strong. Therefore, this initial solution is too irritating. 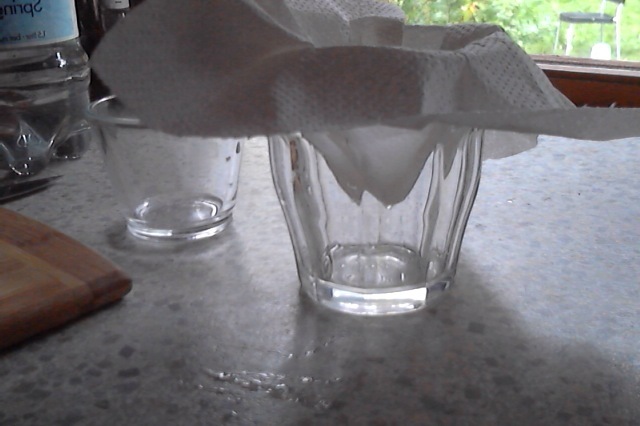 Then you need to dissolve it with more water. Add 2-3 tablespoons of water, and try one drop again. If you get just very light burning sensation (with one possible sneeze and little watery eyes), then it is about optimum. Thus, you need to make the solution that is strong enough (to kill germs due to sinus infection), but not too strong to cause irritation of mucosal surfaces. Stretch your nose as high as possible (as if you are looking straight above you). Then apply 3-4 drops in each nostril of the nose. Start tilting the head to the left and right, back, forward, and to the sides again. You need to make garlic solution to penetrate into all surfaces of sinuses. Sinus surfaces are complicated and you need to make these head movements several times (for up to 30-40 seconds in total). Apply 3-4 drops into each nostril again and repeat head tilting and rotations. Finally, do it once more with 3-4 drops to make sure that all germs in your sinuses get their dose of this super remedy. Thus, in total each nostril got about 10 drops of diluted garlic juice. Apply this home treatment every 2-3 hours (all day long until night or sleep time), about 10-12 drops in each nostril, while moving and rotating your head in various directions to ensure that the solution can reach all inner and hidden surfaces of your sinuses. Usually, it works amazingly fast, often nearly all sinus pathogens (germs) are killed in one day. Many people with low body O2 (less than 20 s) and frequent sinus problems, often do not have any good bacteria left in their sinuses. In order to solve this problem, after you finish this garlic treatment for sinuses, you need to repopulate sinuses with good probiotic-type bacteria (which naturally reside in healthy sinuses). Apply a tiny bit (about 1-2 ml or 1/4 of a teaspoon) of raw unsweetened yogurt inside each nostril of the nose and sniff this raw yogurt inside while tilting the head in different directions. You need to do this only once if you keep the body O2 above 20, better above 30 s all the time to prevent future sinus infections. Share and post this treatment for acute sinus problems on your social accounts.